I’ve read most of Stephen King‘s work and liked most of it too. The Mist was a good one, one of his better ones actually. When I heard Frank Darabont was going to make a movie out of it I figured it would make a pretty good movie. After all the guy clearly has a talent for making flicks out of King’s tales. Maybe you’ve heard of a little film called the Shawshank Redemption. Anyway for whatever reason I missed it in theaters (that happens to me a lot) and just got a chance to watch the DVD. Holy freaking crap! Sorry, that’s for the end. Let me start at the beginning. The story on the surface is a straight up monster flick. A terrible storm in the night brings an odd fog bank in the morning. 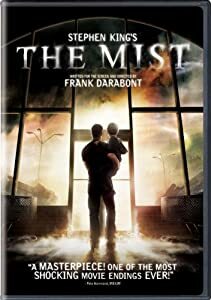 Dave Drayton, our hero, takes his son and neighbor to the supermarket and while there the mist sweeps over the whole town. But of course the mist isn’t the real problem. The real problem is the hideous monsters that live in it. Clearly, none of them belong on this planet and all of them appear to be killers. Holy freaking crap! I won’t spoil the ending in case you haven’t seen it. I will say that the ending of the novella was purposefully vague. Dave and his small group of survivors just keep driving off into the mist desperate but clinging to a very small sliver of hope. The story itself acknowledges the ending and more or less says ‘sorry, it ain’t satisfying but that’s how it went’. Darabont decided to go for something a little more definite. It’s not a happy ending but it’s powerful and it fit the story he had told. It’s also one of the ballsiest endings I’ve seen in a good long while and I have no idea how he talked a studio into it. However he managed it I’m glad he did. If you haven’t seen it, I highly recommend it. .-= Amanda Hawkins´s last blog ..February 15-24 =-. Shocking but not for the sake of shock–for the sake of story. Good endings are hard cuz you don’t always know what a good ending is! Happy? Sad? Ironic? The only thing a writer (or at least me) can say is ‘the ending has to fit the story’. Glad you liked the flick and thanks for reading.